Increase the reach of your advertising campaigns. 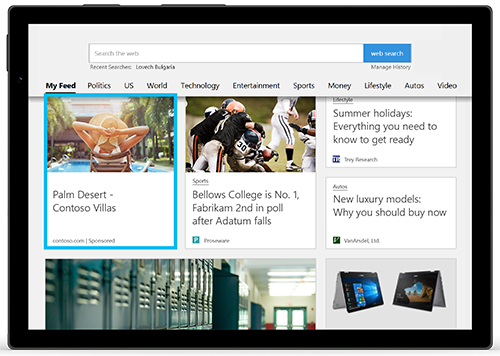 Microsoft Audience Ads (formerly Bing Intent Ads or Bing Native Ads) are the only native advertising solution designed and built by a trusted search platform. 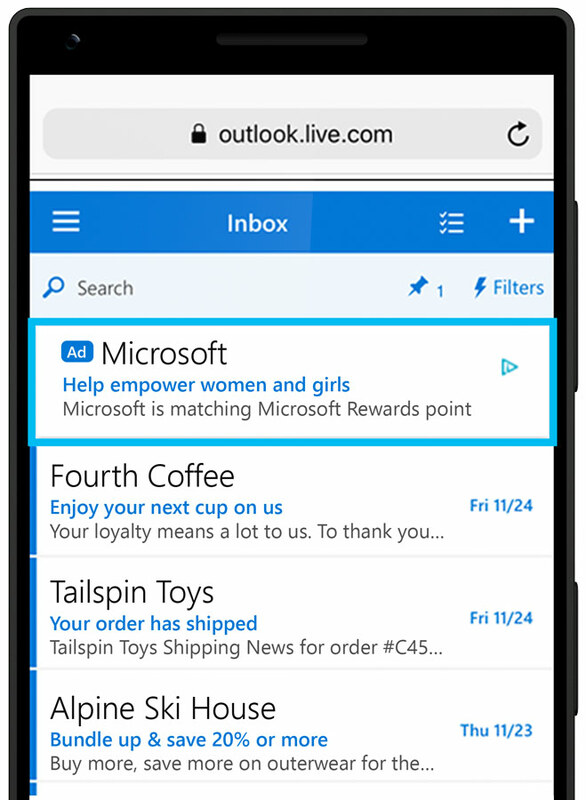 Whether you’re building your brand or driving purchases, Microsoft Audience Ads are an effective, scalable and rapidly growing solution. 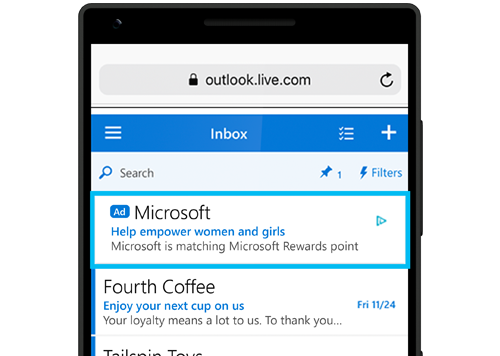 Microsoft Audience Ads are served across the Microsoft Audience Network which is powered by the Microsoft Graph and artificial intelligence (AI). Ad placements across premium sites like MSN, Microsoft Outlook and Microsoft Edge, as well as other partner sites, blend naturally into your consumers' experiences. That way, you can put the right ad message in front of your customers at the right time in their decision-making process. Broaden your reach to connect with the right customers. Why use Microsoft Audience Ads? Boost impressions and traffic through brand-safe, native content placements. By extending your Bing Ads search campaigns to native, you can increase clicks from your target audience. Your ads can reach a much larger audience, increasing your chances for conversions. AI and machine learning help guide ad selection and relevancy matching, along with pricing, click and conversion prediction to help deliver the best marketing ROI. Use the same Bing Ads tools, reports and analytics to monitor your campaign performance. separate from your search campaign. 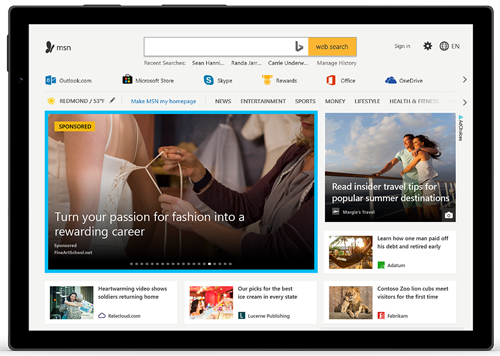 The Microsoft Audience Network can support two responsive ad formats: image-based ads and feed-based ads. Responsive ads automatically adjust to accommodate the sizes and shapes of native ad formats. Use image-based ads to engage your customers with eye-catching visuals. Images are compatible across different platforms, publishers and placements, allowing you to use existing assets from your campaigns on the Google Display Network and Facebook. Using Product Audiences, you can remarket to customers based on the specific products they viewed or added to their cart. Feed-based ads promote those same products to customers (known as dynamic remarketing). You have two ways to run Microsoft Audience Ads. Your existing search campaign is extended to include Microsoft Audience Ads on the Microsoft Audience Network. Continue using a single budget to conveniently manage all campaigns and increase clicks from target audiences. The option to extend your search campaigns is currently available in the U.S., U.K., Canada and Australia. Manage your audience campaign with a dedicated budget and optimized performance metrics. The audience campaign’s budget is separate from your search campaigns. Audience campaigns are currently in closed beta only in the U.S. and U.K.
Microsoft Audience Ads are image-centric. You can take full advantage of these premium placements by quickly and easily managing images via Image Extensions.